The 2-star Hotel Raamus offers comfort and convenience whether you're on business or holiday in Coimbatore. Offering a variety of facilities and services, the hotel provides all you need for a good night's sleep. To be found at the hotel are free Wi-Fi in all rooms, 24-hour security, taxi service, 24-hour front desk, Wi-Fi in public areas. Comfortable guestrooms ensure a good night's sleep with some rooms featuring facilities such as television LCD/plasma screen, internet access – wireless, non smoking rooms, air conditioning, wake-up service. The hotel offers various recreational opportunities. Convenience and comfort makes Hotel Raamus the perfect choice for your stay in Coimbatore. 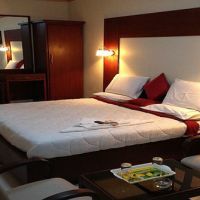 The hotel is located at Nehru Street, Ramnagar, Coimbatore, Hotel ESS Paradise offers well-furnished accommodations with Wi-Fi access to stay connected with friends, family and colleagues. The nearest airport is situated at a distance of 12 km from ESS Paradise and railway station is just 2 km away. It is also easily accessible from local bus stand. No. 27, Davey & Co. Located in the downtown area, this budget property is just a mere two minutes from the railway station. There are 15 double and 15 luxury rooms across 8floors to choose from. The property is maintained with a conference room and a business centre for official purpose. There is also a covered car park area to park private vehicles. Offering an exclusive Indian restaurant, The Mount Hotel is located in Coimbatore. The VOC Zoo and Park and Gandhi Park are just 1 km from the property.Rooms here will provide you with a satellite TV, a seating area and desk. Featuring a shower, private bathrooms also come with free toiletries. Extras include a fan.At The Mount Hotel you will find a 24-hour front desk. Other facilities offered include meeting facilities, luggage storage and dry cleaning. Room service is provided. Sightseeing is possible with car rental facility.The Maruthamalai Temple is 18 km. The Coimbatore Railway Station is 2 km away while the Coimbatore Airport is 12 km. This 20 room's hotel near to the Nehru Stadium is maintained with a multi-cuisine restaurant by the name of Ajanta, which is open for service till 10 in the night. Corporate travelers are also facilitated with couple of conference venues that can accommodate up to 240 people. There is also a travel desk that organizes sightseeing tour on request. Located in Singanallur, Crystal Lake Service Apartments is a perfect starting point from which to explore Coimbatore. The hotel has everything you need for a comfortable stay. Free Wi-Fi in all rooms, 24-hour security, daily housekeeping, fax machine, photocopying are there for guest's enjoyment. Some of the well-appointed guestrooms feature closet, cleaning products, locker, towels, clothes rack. The hotel offers various recreational opportunities. Convenience and comfort makes Crystal Lake Service Apartments the perfect choice for your stay in Coimbatore.